Barefoot in Barra started out as a dream for owner Leigh Davis. 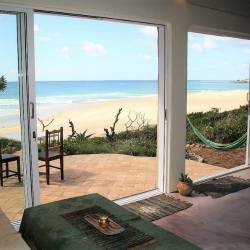 It is now a funky, creative and beautifully styled guesthouse in Barra, Inhambane. This 800 square metre guest house offers a unique holiday concept in the area, not quite a B&B, not quite a backpackers but creatively decorated and comfortable self-catering lodgings which offers accommodation for 10-12 guests in 4 en-suite guest rooms, a family room (4 sleeper), well equipped communal kitchen, lounge and dining area. 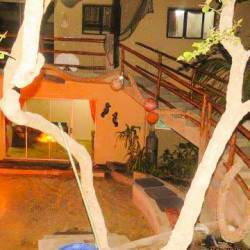 The oval shaped building houses the central courtyard with swimming pool and lush tropical plants. All the guest rooms and communal areas open onto the courtyard which is airy with lots of natural light and in the evenings, studded with starlight. 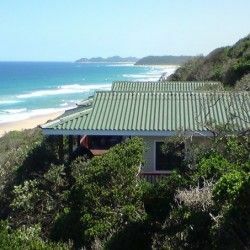 Barefoot in Barra is situated within 1000m from the main Barra Beach, situated within walking distance of restaurants, beach bars and all the fun activities provided by operators in the area.